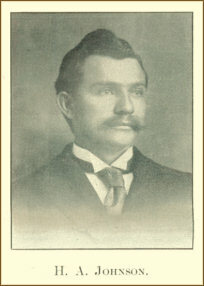 Mr. Johnson was reared on the farm in Anderson county, South Carolina, and was educated at Wafford College, Forman University and graduated at the South Carolina University on the 29th day of June, 1892, and was admitted to the practice of law the same day by the Supreme Court of that state after having the degree of LL. B. conferred upon him by the State University, having worked his own way through said colleges. On the 5th day of May, 1893, he started from Columbia, South Carolina, in a buggy with the determination of "going West and growing up with the country," and drove to the World's Fair at Chicago, and from there to Oklahoma, arriving at Stillwater on the 1st day of September, 1893, and made the run to Perry on the 16th at the opening of the "Strip" to settlement. He staked and held two lots in Perry. and has practiced law here since the opening, having enjoyed the confidence of the people, and a good practice. Among the most notable law suits he prosecuted successfully are the noted "Townsite" cases, being five in number, and involving the title to 800 acres of land within the corporate limits of the city of Perry. He has obtained a final decision in three of these cases in favor of the townsite settlers, and it is expected in the near future that he will obtain the other two final decisions in their favor. He has stood by the people in these cases and fought for their rights as no one else has and the people so appreciate it. No sooner had he won these cases for the townsite people than the townsite board attempted to prove-up the land at an exhorbitant expense of the people without their consent. They again called Mr. Johnson to their relief, and he filed protests against the townsite board's taking such action without the consent of the people. 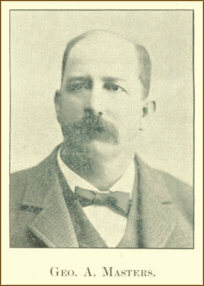 While Mr. Johnson seemed to he the only lawyer who held the opinion that the townsite board had no right to take such action without the consent of a majority of the occupants and owners of the lots, he has maintained his position and prevented the board's making any further progress in the matter, although the fight commenced over a year ago. He now has a bill pending before Congress abolishing the townsite board, and providing means by which the people can hereafter afford to prove-up townsites in Oklahoma. 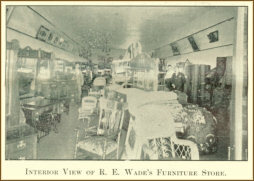 Among the various lines of business represented in Perry none are more complete than that of furniture and undertaking and the large house of R. E. Wade's almost exclusively controls the trade in these lines. Mr. Wade has been a resident of the city since the"opening" and his business has steadily grown until he now has one of the largest of the kind in the territory. He is located in the brick block north of the square. The interior of this large room contains most every conceivable article that is useful in the house or may be made to beautify it. The styles, prices and quality vary from that which is required to fit up the humblest home to decorating a palatial residence. The highest quality combined with a suitable price is the rule in this house, and anyone needing furniture or carpets can not afford to buy away from Perry if they are within reach of this point. Call on R. E. Wade and he will give you bargains which cannot be obtained elsewhere. In addition to conducting this large establishment, Mr. Wade is the mayor of the city, having been elected to that high position last spring. This gentleman is a new addition to the legal talent of Perry, having recently located in this city. He comes well recommended from his former city as a gentleman of push and ability and we bespeak for him a successful career in Perry. Mr. Brown is a Republican politician of note and quite a power upon the stump in a campaign. He will have his office in the front rooms of the Evan's block over Mr. Wade's furniture store. Mr. Brown represents large capital and will make a specialty of farm loans. One of the largest yards of this well known company is located in Perry and it adds no little to the city in the way of making it an important lumber market for a large section of country. The yard in this city is situated on west C street, two blocks west from the square. The buildings are neatly arranged and painted (continued on page 8).